A Libby resident is making major changes in our schools. After her grandson was bullied on a school bus, Teri Noble had a realization about kindness. Kindness is such a small act that can make a major difference in anyone’s life. We have all heard that bullying is a major problem in schools everywhere, but not many of us act. Noble made it her mission to help children understand what kindness looks like. She started a kindness program in partnership with Libby Elementary School’s ROAR program. ROAR stands for; respect, organization, attitude, and responsibility. Noble took $5,000 of personal money and began the #KindIsTheNewCool program to reward students for demonstrating kindness around the school. She was also presented with a donation of $500 from LCCU to keep the program running at LES in 2019. Prizes are all donated by community partners including Lincoln County Credit Union, the Dome Theatre and others. Prizes and recognition encourage students, but they are not the only ones excited about this new program; the adults are too. 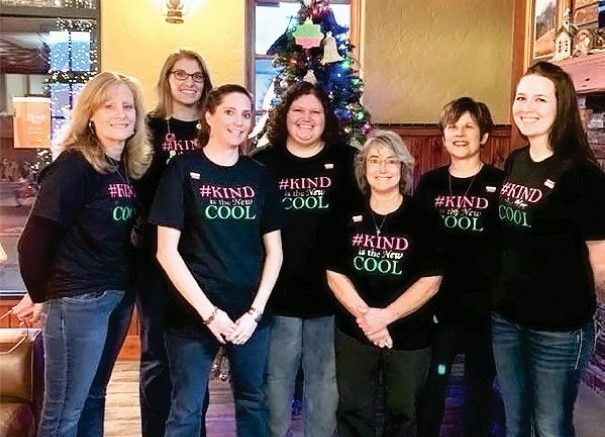 Teachers even wear their #KindIsTheNewCool t-shirts every Monday. Lincoln County Credit Union’s employees also plan on wearing their shirts every Monday to help spread the word about kindness. Noble continues making headway spreading the word about her new program. Her goal is to see the entire community support the idea of modelling kindness for youngsters through positive reinforcement and leading by example. Most people would agree, we could all work on being a little kinder to each other. Anyone else interested in supporting the cause is welcome to do so. The initiative costs at least $5,000 to run each year. Donations for the program through the credit union can be sent to LCCU at P.O. Box 1586 in Libby. To learn more visit LES or stop by the credit union. Lincoln County Credit Union sports their new Kind Is The New Cool t-shirts. 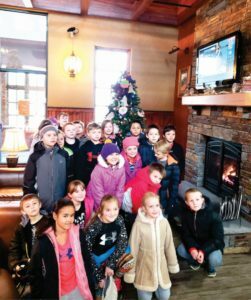 Right: Libby Elementary School students visit LCCU to learn about money and more. During the visit the students had the chance to decorate LCCU Christmas tree. Photo courtesy of Tiffany Smith.